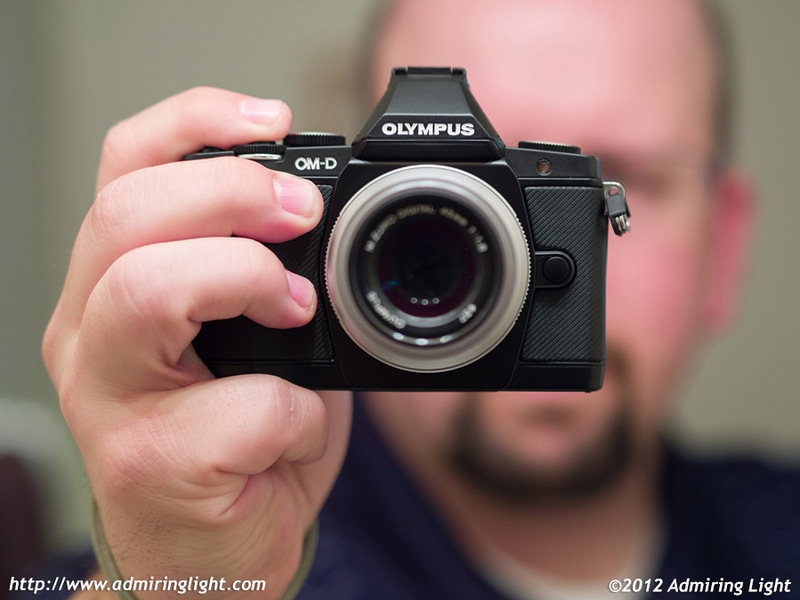 When Olympus announced their latest camera, the OM-D E-M5, there was more buzz among the photographic community for this release than there had been for probably any other Micro 4/3 camera since the original E-P1. Olympus resurrected their legendary ‘OM’ system name for this camera, creating a new line of Olympus Micro 4/3 cameras to sit above the popular Pen series which it has dubbed ‘OM-D’. 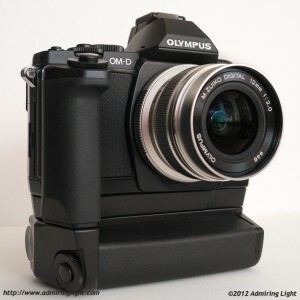 Olympus has seemingly tried to do it all with this camera. A great blend of retro and modern styling, a high resolution tilting capacitive touch screen, blazing fast autofocus, 9fps burst shooting, full weather sealing and an improved 16 megapixel sensor. It’s positioned as the ultimate in the Micro 4/3 system. Now, we’ve all heard these types of promises before. Sometimes cameras live up to the hype, most of the time they don’t. It can be difficult to read between the lines of the marketing speak, but that’s what I’ll attempt to do here. If you’ve read my reviews before, you know I don’t do resolution tests or charts or graphs depicting every exact timing. There are plenty of quality sites out there for you to get that information if you like. I discuss all the major aspects of the camera as it relates to shooting in the field, from a photographer’s perspective. 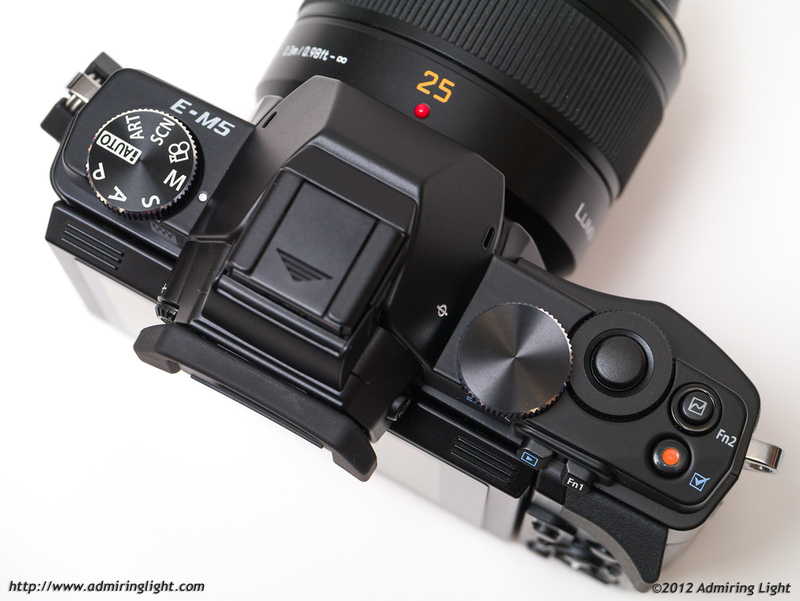 So, does the E-M5 live up to the hype? Let’s find out. Olympus went back to its roots with the E-M5. 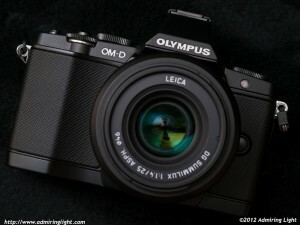 The camera has a retro styling evocative of the old OM series SLRs. 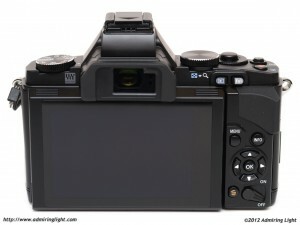 In fact, from the front, the E-M5 looks very similar to the OM-4. However, Olympus did throw in some modern refinements to the styling. The front grip isn’t flat like those 80s SLRs, but has a nice contoured surface. The camera is available in both Silver and Black, with the Silver version having a more retro leatherette grip and accents, while the black has a more modern grip that looks almost like a textile carbon fiber. In both cases, the camera strikes just the right balance in my opinion, and I think it’s one of the most attractive cameras to come out in the past 10 years. The back of the camera is all modern, however. The most prominent feature is the 3″ OLED semi-articulated capacitive touch display. The rear has a host of buttons, most of which are programmable. The right and down arrows and the Fn1 button can all be programmed to a variety of functions, as can both the record button and the Fn2 button on the top of the camera. The buttons are a bit squishy and soft, presumably from the weathersealing. They aren’t quite as pleasant to use as many other cameras I’ve used, and the tactile feedback isn’t as sure, but I have had no difficulty operating the buttons, and I feel the layout of them is quite nice. Some people have reported difficulty pressing the Play and Fn1 buttons due to their slightly recessed nature, but I have not had any issue. There is a lovely sculpted rubber thumb rest that really aids in a secure grip. About that grip. There has been a fair bit of debate about Olympus’ choice of location for the neckstrap lugs. They are positioned much the way they were on their old OM SLRs, and depending on how you grip the camera, the right lug may prove to get in the way. Since I shoot with a wrist strap instead of a neck strap, I removed the triangular lug piece and secured my wrist strap directly to the post. This has helped a fair bit. I also hold the camera in a way that is comfortable, allows a sure grip and easy access to controls, while completely avoiding the strap lug. You can see how I hold the camera at the right. This also gives you a good idea of the size of the camera. Due to the retro SLR styling, I feel the E-M5 looks bigger than it really is in pictures. In actuality, it’s almost the exact same size as the Olympus E-P3 and the Panasonic GX1, just with a protruding viewfinder hump on top. It’s quite a small camera. On top, the camera has a mode dial on the left and dual, programmable function dials on the right side along with the two programmable buttons and the shutter release. I generally use the ‘rear’ dial with my thumb and the one surrounding the shutter button with my index finger, though they are positioned in a way that the rear dial can easily be operated with your index finger as well. These dials can be customized to operate a variety of parameters. I changed the default settings when I got the camera to make the front dial control aperture or shutter speed in their respective priority modes, with the rear dial set to exposure compensation. Overall, the camera construction is very solid and feels good in the hand. The shutter release has a nice feel and a sure half and full press. As I mentioned earlier, this camera is the first Micro 4/3 body to feature weathersealing, though at the moment the only weathersealed lens to go along with it is the 12-50mm lens that is one of the kit options. I haven’t had a chance to thoroughly test the weathersealing, but from all reports, it does its job quite well. The E-M5 has an optional grip available, the HLD-6, which is unique in that it’s a two piece grip. The first piece is a horizontal grip that attaches to the bottom, making the camera slightly taller, but adding a prominent hand grip with extra shutter button and front dial. This is great for keeping the size of the camera small but adding a bit more purchase for your hand while shooting with larger lenses, or any lens if you’re so inclined. The downside to the horizontal grip is that you have to remove it to replace the battery. You also can then add the portrait grip to the horizontal grip, giving you the option to add an additional battery of capacity and providing a deep portrait grip with front and rear dials and two new programmable function buttons as well. The addition of both pieces of the grip can transform the very tiny E-M5 into a still small, but chunkier and more ergonomic machine. Since the publication of this review, I have had a chance to fully evaluate the HLD-6 battery grip. Click here to read that review.